Data files should be organised and named in a consistent and practical system, to make it easier to find and keep track of data. File names should help classify files, uniquely identify files and provide information about the content and status of the file. 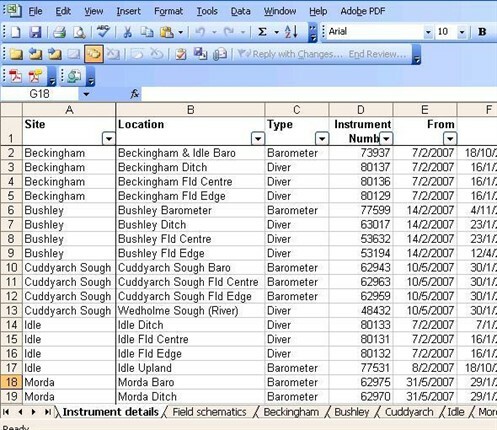 Examples of filenames for scientific data are available from the Centre for Environmental Data Archival. More detailed advice about file naming is available from JISC. Tip: to ensure files are compatible across platforms, such as Windows and Apple, the 8.3 Naming Convention should be used. This limits names to eight characters, followed by a three-character extension (such as 12345678.txt). It is important to take the time to plan how to structure files in folders to enable quick location, especially when working in collaboration with others. Use existing conventions and procedures, from your project team or Research Centre, to structure folders. Tip: Assess what data you have regularly to ensure files are not kept pointlessly. Put a reminder in your calendar so you don't forget! Tip: However you choose to arrange your files, make sure you write down what you've decided in an index file (e.g. Word or text document) that you keep with the files. This only takes a few minutes, but can save hours of searching later. Version control is managing different versions and drafts of a document, file, record or dataset. It provides an audit trail for the revision and update of draft and final versions. Version control is important for working on collaborative documents with a number of contributors, and for knowing which version of a file is being used or enforced. Final approved versions and major changes should be indicated by whole numbers e.g. v1-0 would be the first major version, v2-0 the second major version. indicates a minor change has been made to the first version, and v3-1 a minor change has been made to the third version. Tip: Include a version control table in files to detail each time a change is made; see an example below. Data documentation encompasses all the information necessary to discover, interpret, understand and use data. This is important for collaborators, original researchers returning to data, or new users of data. Good documentation is vital for successful data preservation as data can quickly become unusable if key details of the context have been forgotten. All of this extra information is collectively known as metadata. Publisher/Repository requirements – e.g. the UK Data Service requires depositors to provide DDI-compliant metadata. Data journals require authors to submit a Data Paper alongside a dataset. Creating data documentation from the start of a project makes it easier to manage and understand data later in the research lifecycle. Therefore, include procedures for documentation in your data planning. Catalogue metadata – a subset of core data documentation providing standardised structured information, usually associated with the data required when depositing in a repository. Metadata are typically used for discovery, providing searchable information that helps users to find existing data, as a bibliographic record for citation, or for online data browsing. Detailed guidance is available from the UK Data Service for both tabular data and qualitative data, and guidelines are available about documenting qualitative data using NVivo 9. Tip: for lab-based research, documentation is often recorded in a lab notebook, so make sure this is kept safe. Record the lab notebook page number with the data files, and if possible, scan the page(s) and keep them with the data. If the data or artefact absolutely cannot be digitised, consider other options for protection, such as a fireproof safe. Best practice and standards for digitising analogue media is available from JISC Digital Media.